Bass & Reiner Gallery is pleased to present Self World, an exhibition of works by Lisa Jonas Taylor and Jack Schneider. Taking inspiration from the Umwelt of German semiotician Jakob von Uexküll, this exhibition presents environments or ecologies as sites for unique and individualized experiences across species. Lisa Jonas Taylor’s most recent paintings and sculptures recreate real and imagined environments at human scale. 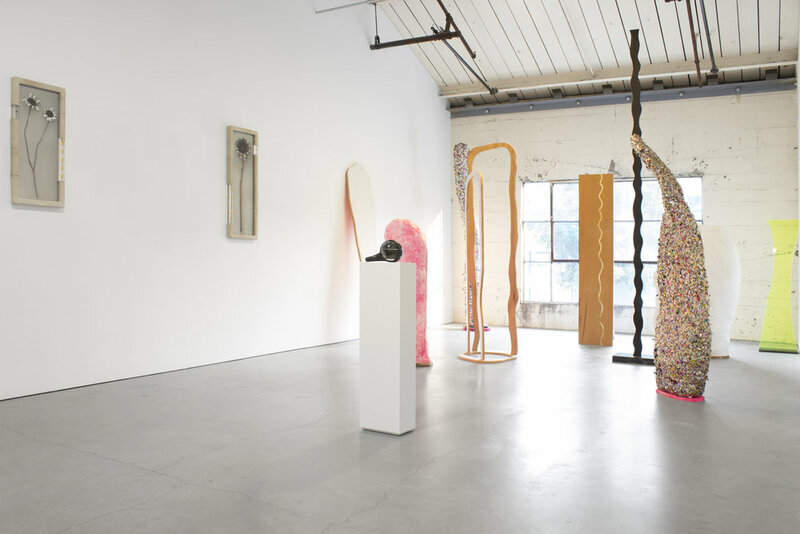 Approximations or stand-ins for the objects they represent, Jonas Taylor’s works behave like props and backdrops to generate spacio-social scenarios through the proximity, density, and movement of viewers around the arrangements. Both anthropomorphic and monumental, humans are welcome interlopers in this strange world. Jack Schneider’s works are an exploration of aesthetic formations that exist beyond the human experience of reality. Using a modified digital camera that removes all wavelengths of light besides ultraviolet, the camera captures more information for an audience of bees than it does for an audience of humans. Capturing species of flowers whose petals act as sexual instruction manuals visible only in the ultraviolet and framing the images within cast concrete and resin frames, Schneider’s objects are ecosystems unto themselves.